Learn about current and future differences between "NetSuite for Outlook" and CloudExtend Outlook for NetSuite and what is planned. NetSuite for Outlook (NS4OL) is owned by NetSuite and the new CloudExtend Outlook for NetSuite was built by the team at Celigo's CloudExtend brand. This article is meant to highlight the differences between the versions and will be updated as needed. CloudExtend Outlook for NetSuite is a modern Outlook add-in that can replace NS4OL or be used side by side. It is available now in free and paid versions with many of the features you are used to in NS4OL as well as new features and support for Mac, Office 365, and mobile. CloudExtend Outlook can be installed in just a few clicks and is available with a free trial. Complete installation instructions are right here. What's missing in the CloudExtend integration? We want to be upfront with you. While there are currently many new features in the CloudExtend Outlook integration not in NetSuite's NS4OL version (see next section) there are also some gaps at present. Contact Sync: NS4OL allows end users to sync contacts bi-directionally while CloudExtend instead allows customers to create and edit NetSuite contacts via the App (the Contact is only created in NetSuite). In our interviews with NS4OL customers the Contact sync was rarely used but we did hear that if it was designed differently it could have more use. A bi-directional Contact sync is under consideration. Bi-directional Calendar Sync: NS4OL allows end users to create events in NetSuite or Outlook and have them sync bi-directionally. We've built our sync with Outlook as the master (changes must also be made in Outlook). We also allow users to attach events to NetSuite records from Outlook. In our interview with NS4OL customers the Calendar sync was rarely used. There were, however, a number of compelling use cases for bi-directional syncs, especially when events need to be created in NetSuite and custom fields populated. A bi-directional sync is on our product roadmap. Meanwhile we encourage customers to use NetSuite's free iCal solution to sync from NetSuite to Outlook. Task Sync: NS4OL syncs tasks bi-directionally between NetSuite and Outlook. CloudExtend allows users to create NetSuite tasks directly via the App (the task is created only in NetSuite). A two way task sync is under consideration. Phone Call Sync: NS4OL allows users to create a phone call event in NetSuite which syncs to Outlook as an event. A phone call sync is planned that will allow users to create an event in Outlook and allow you to specify if you want it to sync as an event or a phone call in NetSuite. What does CloudExtend offer that NS4OL does not? 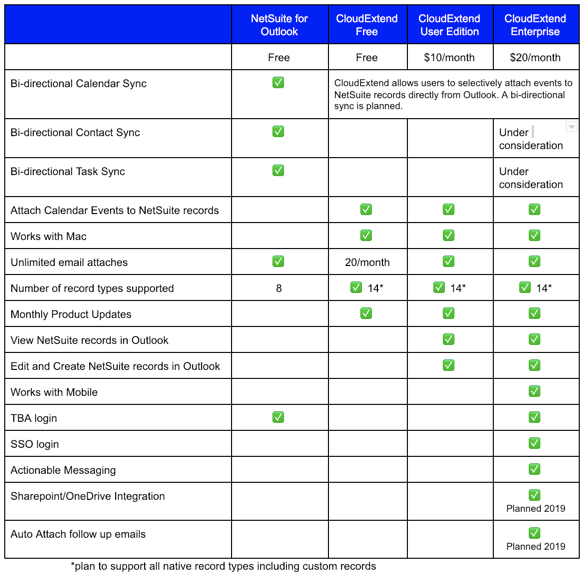 The CloudExtend integration does not require a NetSuite bundle to be installed, supports Office 365, and can be used on Mac or PC. It can be installed with just a few clicks directly from the Microsoft Office store. Mobile Version: Users can attach emails to NetSuite records using the native Outlook App, no need to install any 3rd party mobile apps. Available in our paid version(s). Additional sign in methods: While both NS4OL and CloudExtend Outlook for NetSuite support TBA, CloudExtend also supports SSO. Works with online email: CloudExtend offers full functionality regardless of whether it is used in a browser or in desktop Outlook. Available in our FREE version. Fully compatible with Office 365: CloudExtend offers full compatibility with Office 365 Exchange based email. Available in our FREE version. Support for more record types: In addition to the standard record types supported by NS4OL CloudExtend adds support for attaching emails to vendors and purchase orders. Support for more record types is planned. See this link for a complete list of record types. Available in our FREE version. Calendar sync: When creating an event in Outlook end users have the option of attaching to a a NetSuite record (customer, contact, opportunity etc.). The advantage to this approach is that customers can use a best of breed calendar integration yet still attach the events to NetSuite records for visibility and reporting purposes. Create new NetSuite records directly from Outlook: CloudExtend enables Outlook users to create new Customer, Contact, and Task records directly from within Outlook saving precious time switching between applications/browser tabs. Available in our paid version(s). View NetSuite records directly in Outlook: CloudExtend users can quickly search and view NetSuite records directly in Outlook. See this link for a complete list of viewable record types. Available in our paid version(s). Edit NetSuite records directly in Outlook: CloudExtend users can directly edit Customer and Contact records within Outlook. Available in our paid version(s). Actionable Messaging: Users that are responsible for approving expense reports and time entries will be able to use 'Actionable Messaging' to approve them directly in Outlook saving valuable time by not having to switch applications. Available in our paid Enterprise Edition. Bundle based performance enhancements: By leveraging search functionality in our bundle users under an Enterprise Edition subscription will see an immediate 300% plus improvement when searching for NetSuite records to attach to in NetSuite. Learn more about the Bundle here. Available in our paid Enterprise Edition. License Management Portal: Companies with 5 or more paid licenses receive access to an online portal where they can add/remove users and better manage their employee onboarding/offboarding processes. Available in our paid version(s). In addition to regular performance improvements the following features are on the CloudExtend roadmap. The timeline will be updated as our work progresses. Smart Auto Attach: We're firm believers in giving users control over which emails to attach to NetSuite. Smart Auto Attach will allow a user to attach an email to NetSuite and specify that all future threads for the same email will attach to the same records without user intervention. Bi-directional Calendar Sync: A bi-directional sync is on our product roadmap. Meanwhile we encourage customers to use NetSuite's free iCal solution to sync from NetSuite to Outlook. Phone Call Sync: A phone call sync is planned that will allow users to create an event in Outlook and allow you to specify if you want it to sync as an event or a phone call in NetSuite. Contact Sync: CloudExtend already allows users to create a NetSuite contact directly from Outlook. A bi-directional sync between NetSuite and Outlook is under consideration. Questions, something missing from our list? Use the chat icon at the bottom of this page to contact us or send an email to cloudextend-sales@celigo.com.